I am always trying to challenge my students in different ways to not only make it more enjoyable but more physically challenging. If students can learn to push their bodies more than their limit, they will find themselves feeling more successful and stronger. I found myself on Twitter looking at different activities, where I saw an activity which involved hula hoops and beanbags. The activity had more of a relay style but with a fitness component. 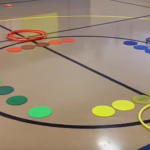 When I did this activity with my students, I thought, “How can I use the same equipment, but turn this activity into something different which will make it more challenging and fun for the students?” This is when I came up with the Four square Hula Hoop activity. Students will get in a group of 4. Each student will have a hula hoop and a bean bag. Set up the hula hoops in the shape of a square, and have one bean bag in each hula hoop. 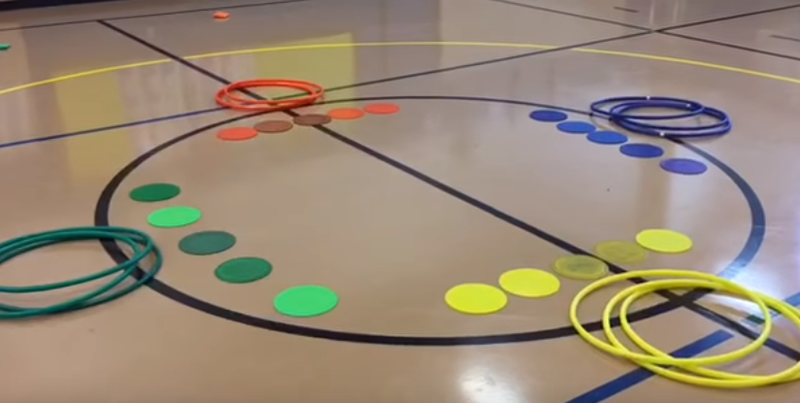 On your “GO” signal, students will be in the push-up position, with their hands behind their hula hoop trying to toss bean bag(s) into the other three hula hoops. When you give the “STOP” signal, students will see how many bean bags they have in their hula hoop. Each bean bag represents a point. The object of the activity is to have the fewest amount of points at the end of each round. When the bags are being tossed out of the hoops, you can have the student that tossed the bag out of the ring go return it. Students loved this activity! 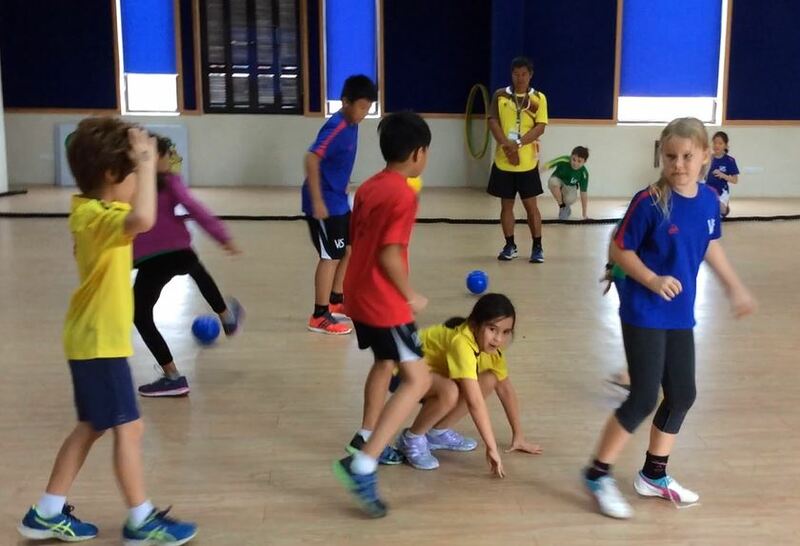 It works on teamwork, fitness, spatial awareness, and underhand throwing skills. It’s a competitive activity but enjoyable, where the students don’t realize how much work/energy they are doing until they are done. Activities where you can have students multi-task or work on multiple skills help them grow as a learners and as individuals. Kash Aleem attended the University of Texas and received his Bachelor’s of Science Degree in Kinesiology. He has been teaching Physical Education for 9 years. In 2014, he was a CATCH Champion for the state of Texas. His school in 2014-15 was recognized as a National Exemplary School for Physical Education from TAHPERD. Kash has been nominated for Teacher of the Year twice, and most recently was inducted as a lifetime PTA member. He currently opened a new school this year called Maydell Jenks Elementary. Kash strives to help his students be physically literate, accumulate health knowledge, and learn the skills needed to be successful. He wants his students to feel confident when they go in the real world that they can try any sport/health related activity. Follow Kash Aleem on Twitter @physedmanrising and Facebook at Jenks Physical Education. 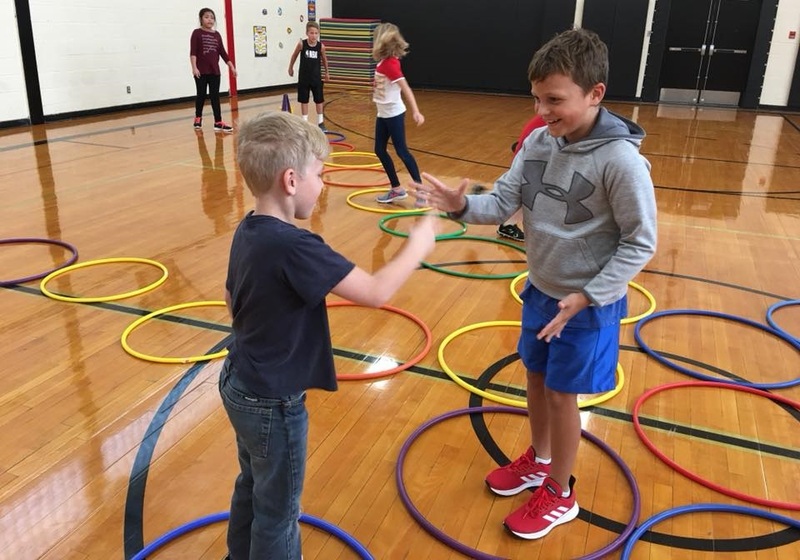 This entry was posted in Hula Hoop, PE Activities & Games, PE Central and tagged four square, four square hula hoop, hula hoop, Kash Aleem, PE, PE activities, pe teacher, physed, Physical Education by Guest Blogger. Bookmark the permalink. what grade levels do you do this game with? 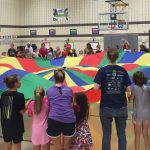 Grades K-5 can do this activity. The younger the grades, the less time you can play each round due to fatigue. Give it a try and let me know how it goes. I like this idea! I have a small space area, so I will see if it will fit into my space. Thanks for sharing! I’m a former PE teacher and now a substitute teacher.. this will be a great “brain break ” activity and warm up!!! Great activity. I love the different variations. Penalty points for throwing out of the hoops and not stopping on the signal. Low score wins, right?! This is the only problem I see with a great idea. What to do when the bags are being tossed out of the hoops. How about making the student that tosses the bag out of the ring go return it. Hi Curt, this is a great idea, thanks for sharing! I will add it to the blog post. 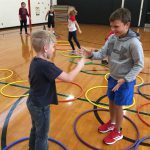 To motivate students to accurately toss the beanbags in partner hoops rather than simply flinging away, give separate “Reward Points” to foursomes who at “Stop” signal have all 4 bean bags within hoops. Very good, very creative. I am also a teacher and we have to be creative in this area. Best P.E. teacher! Our students love Cioach Akeem! He’s always pushing not only our students but he encourages our staff too!